An FHA loan is insured by the Federal Housing Administration, a federal agency within the U.S. Department of Housing and Urban Development (HUD). The FHA does not loan money to borrowers, rather, it provides lenders protection through mortgage insurance (MIP) in case the borrower defaults on his or her loan obligations. Available to all buyers, FHA loan programs are designed to help creditworthy low-income and moderate-income families who do not meet requirements for conventional loans. FHA loan programs are particularly beneficial to those buyers with less available cash. The rates on FHA loans are generally market rates, while down payment requirements are lower than for conventional loans. Only a 3 percent down payment is required. Closing costs can be financed. Lower monthly mortgage insurance premiums and, under certain conditions, automatic cancellation of the premium. FHA limits the amount lenders can charge for some closing cost fees (e.g. the origination fee can be no more than 1% of mortgage). Loans are assumable to qualified buyers. VA guaranteed loans are made by lenders and guaranteed by the U.S. Department of Veteran Affairs (VA) to eligible veterans for the purchase of a home. The guaranty means the lender is protected against loss if you fail to repay the loan. In most cases, no down payment is required on a VA guaranteed loan and the borrower usually receives a lower interest rate than is ordinarily available with other loans. Closing costs are comparable and sometimes lower - than other financing types. No private mortgage insurance requirement. The Mortgage can be taken over (or assumed) by the buyer when a home is sold. Counselling and assistance available to veteran borrowers having financial difficulty or facing default on their loan. Although mortgage insurance is not required, the VA charges a funding fee to issue a guarantee to a lender against borrower default on a mortgage. The fee may be paid in cash by the buyer or seller, or it may be financed in the loan amount. 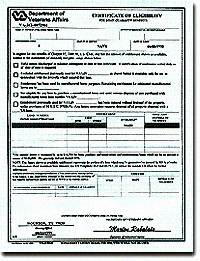 A VA loan can be used to buy a home, build a home and even improve a home with energy-saving features such as solar or heating/cooling systems, water heaters, insulation, weather-stripping/caulking, storm windows/doors or other energy efficient improvements approved by the lender and VA.
Veterans can apply for a VA loan with any mortgage lender that participates in the VA home loan program. A Certificate of Eligibility from the VA must be presented to the lender to qualify for the loan.